I shut my eyes and hold my breath for a moment while I make a wish. My eyes flutter open and I blow out my candles. Happy 24th birthday to me! Another year under my belt and a world of possibilities before me. Do you need a better reason to celebrate? My goodness, the gift of life is truly incredible. The morning of my birthday I sat in the dimmed light of my kitchen thinking about how wonderful it is to be alive. Not some brain crunching, deep philosophical thinking, just pure appreciation of all my abilities and the endless possibilities that come with living. We have the ability to dream, create, run, sing, laugh, love - the list is endless. And to think we get to share this special gift of life with others! I sat there smiling to myself, slowly sipping my warm coffee from my favorite mug completely smitten. No wonder we use our birthday as a reason to celebrate this precious gift! 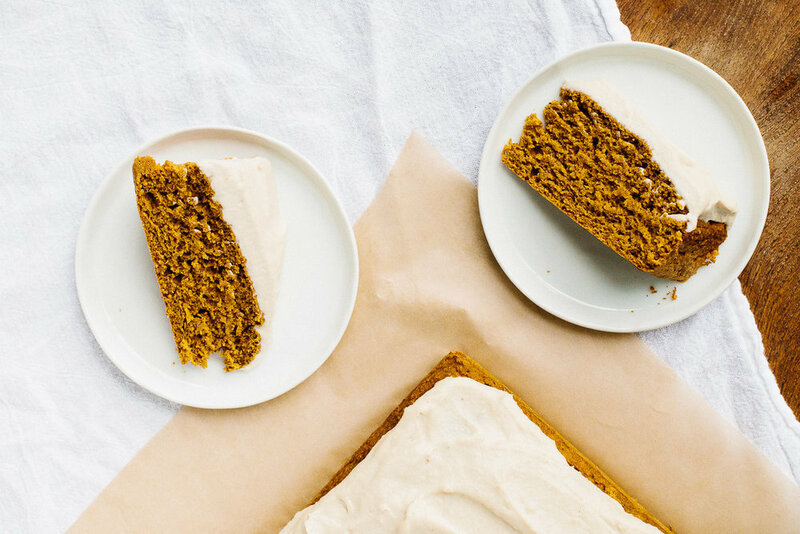 This snack cake is an ode to the pumpkin bars I would routinely ask my mom to make for my birthday each year growing up. You know the cake-like bars I'm talking about, right? Those incredibly moist, tooth-achingly sugary, warmly spiced bars with the thick cream cheese frosting that most people make around Thanksgiving - yep, those are the ones! I was head over heels for those bars and can remember eating them for breakfast, snack and dessert. And I was lucky enough my wonderful mom would let me, always balancing out with something more nutritious such as a hard boiled egg or yogurt (thanks mom!). 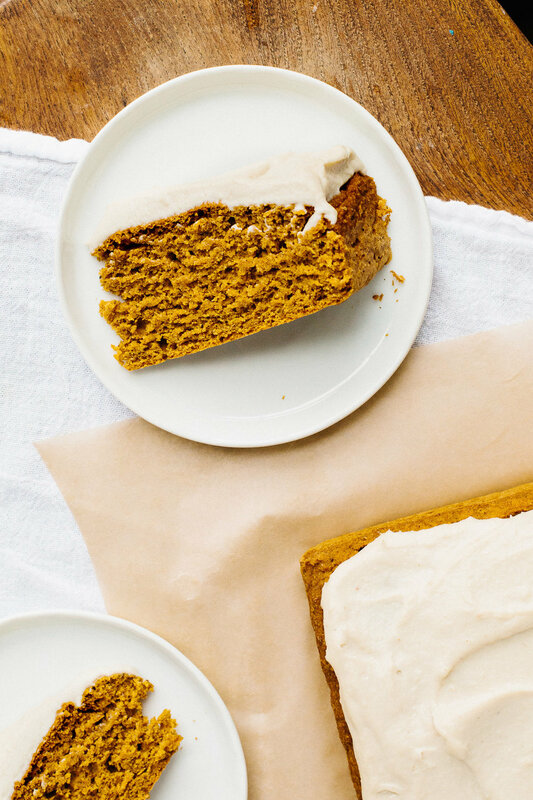 This pumpkin snack cake has the essence of those pumpkin bars of my childhood, however the ingredients are quite different. This cake is made with wholesome ingredients that energize your body and won't leave you tired and sluggish from a sugar cash. Only sweetened with maple syrup this cake is lightly sweet, which I prefer, and when paired with the sweet cashew cream it is pure bliss! The moment I took the first bite of my birthday cake was so delighted with the results, I proceeded to dance around the kitchen, plate in hand, until I finished every last bite. I hope you enjoy this recipe and even if it's not your birthday, make this cake and celebrate the gift of just being alive! You may replace the spices with one teaspoon of cinnamon and two teaspoons of pumpkin pie spice or 1 tablespoon pumpkin pie spice. I have made this recipe using a combination of light spelt flour and brown rice flour, however you will need to reduce the almond milk to only two tablespoons instead of six. Aquafaba (the liquid drained from a can of chickpeas) is used as the egg replacement in this vegan snack cake. Feel free to use 2 flax eggs but it will not be as fluffy. The cake is best stored unfrosted but any leftover cake with frosting stored in the fridge is still delicious. Preheat the oven to 350F. Line an 8x8 pan with parchment paper or lightly coat with coconut oil. Warm roughly two tablespoons of coconut oil on the stove or in the microwave. Bring the almond milk and aquafaba to room temperature. In a pinch this can be done on the stove or microwave. If these ingredients are cold the coconut oil will clump when combined. In a large bowl combine the dry ingredients. Whisk together to ensure the baking powder, baking soda, and salt are evenly distributed. In a medium bowl whisk together the pumpkin puree through aquafaba until smooth. Add two tablespoons of the melted coconut oil and continue to whisk until completely incorporated. Add the wet ingredients to the dry ingredients, mixing just combined (refrain from over mixing). Pour the batter into the prepared baking pan. Use a spatula or back of a spoon to make make sure the batter is evenly distributed. Place in the middle rack of the oven for 35-40 minutes. My oven tends to run hot and the cake was done at exactly 35 minutes. To check, poke the center of the cake with a toothpick. It will come out clean when completely baked. Let the cake rest for 5 minutes then transfer from the pan to a cooling rack to finish cooling. Once cooled, frost the top with the cashew butter cream (recipe below). Cut into slices and enjoy! The cake can be stored in an airtight container at room temperature or in the refrigerator. Best if eaten within 3 days. Vegan cashew buttercream frosting sweetened with maple syrup. Combine all ingredients in a high-speed blender and turn on high, using the temper to help the mixture blend smoothly.